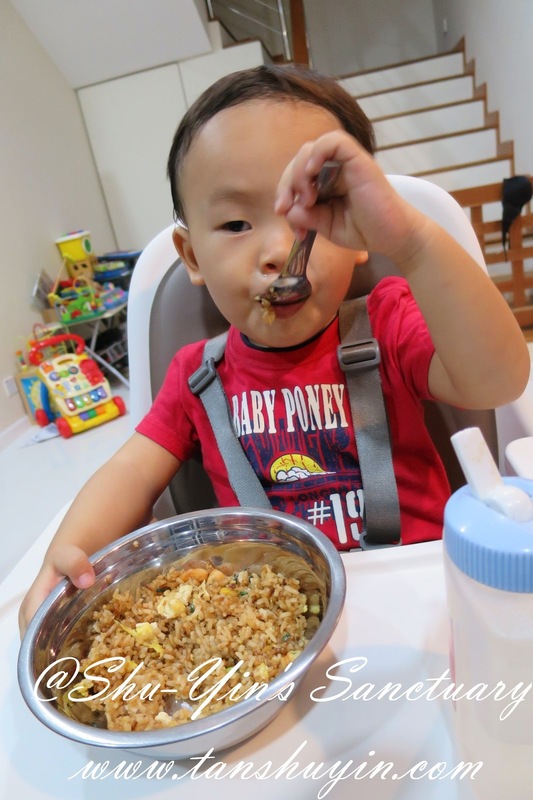 As you know, I am already so in love with all the other products I'd had by OXO Tot - Baby Blocks Freezer Containers, the Twist Top Water Bottle, Flippy Snack Cup, Sippy Cup Set, and Divided Feeding Dish. 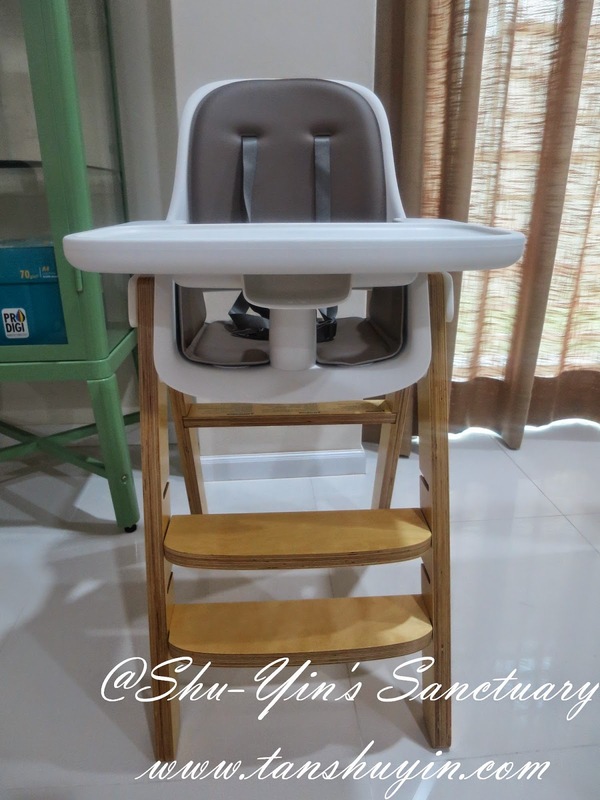 But I love this even more - OXO TOT's SPROUT HIGH CHAIR TAUPE-BIRCH, one of my very favourite OXO Tot products I'd tried! 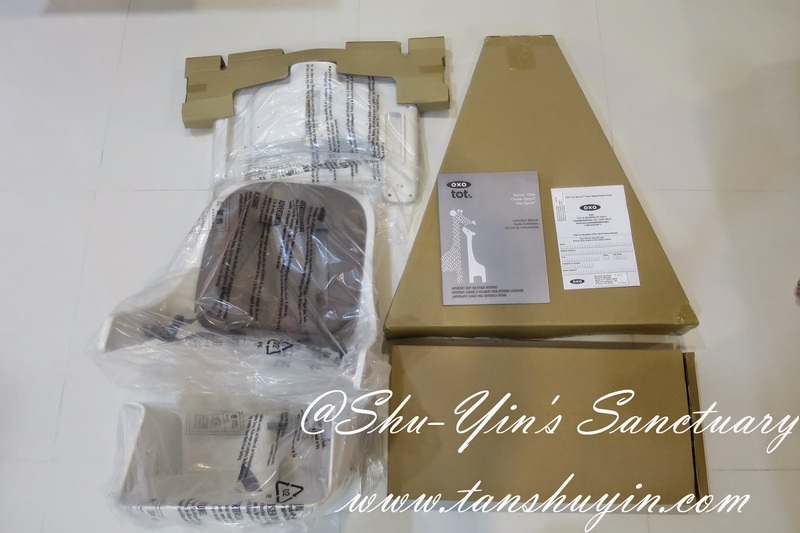 The packaging is simple and straightforward, as it came in a huge box. 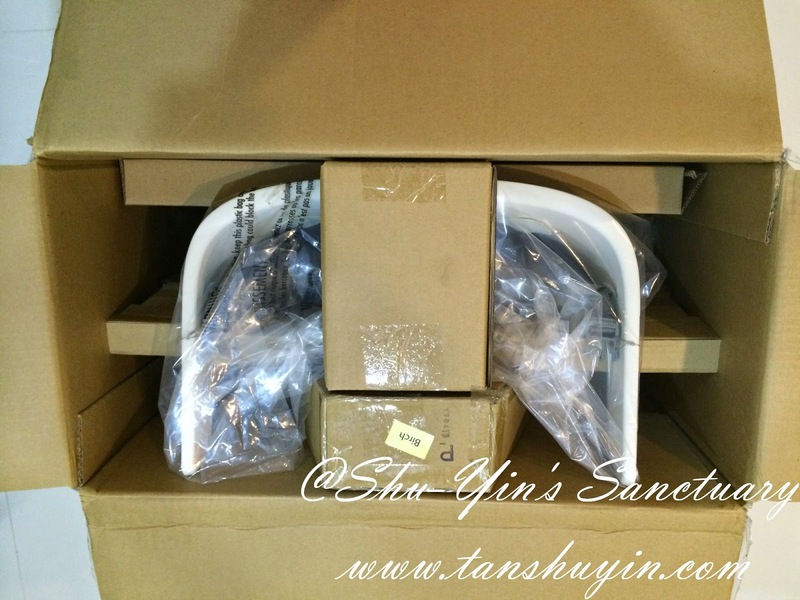 The box was sturdy and made of hard and thick cardboard, thus protecting the contents inside. Brand name and logo and also the description of the content was printed on the box, making it easy to identify. The contents were arranged in such a way with cardboard and such that it could not be moved or flung about during transportation, so that they were not dented or spoiled in any way. 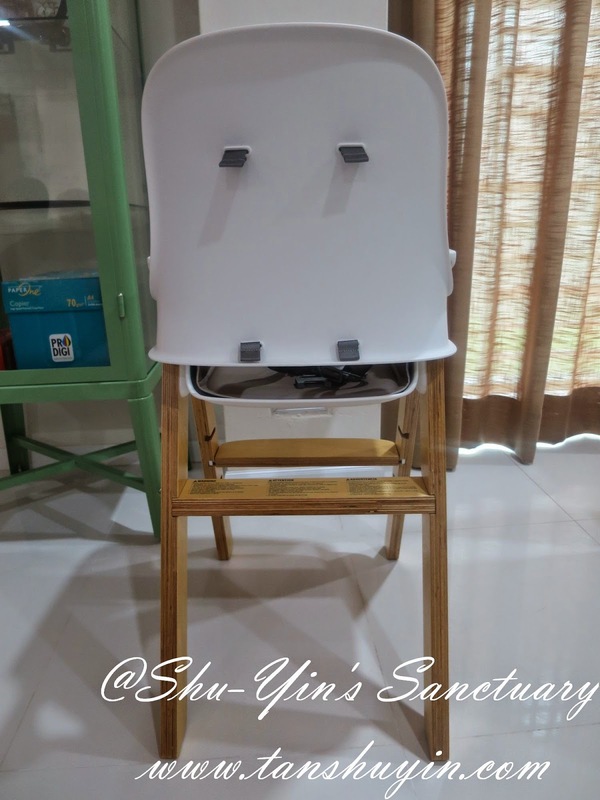 There are 3 big plastic pieces wrapped in transparent plastic of the high chair, and the wooden legs/parts are packed compactly inside the cardboard, together with the screws and all. In it also came a booklet of the Instruction Manual and Warranty Registration Card. Me, being a cautious person, always love reading manuals. So I read the Instruction Manual carefully before assembling the high chair. 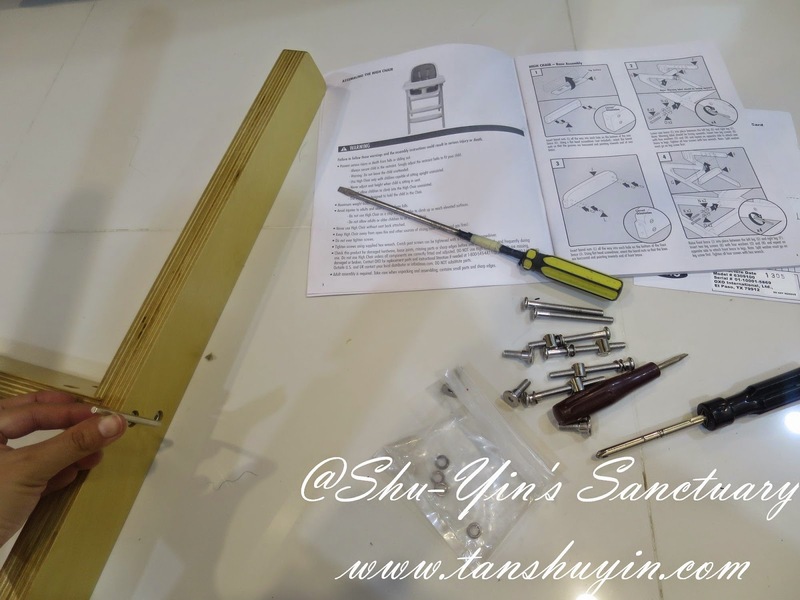 The Instruction Manual was easy-to-understand and picture-friendly which came with clear, step-by-step instructions and pictures. All the screws came with it and also the Hex Wrench (the L shaped metal thingy). So all that was needed to assemble it was a Philips head Screwdriver. 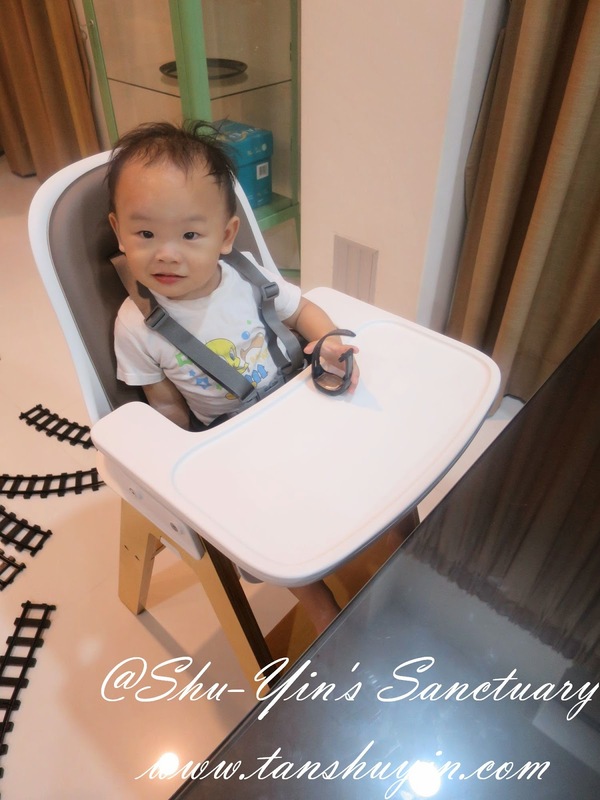 It was easy to assemble the high chair, even for a noob person like me. I did it in about 1/2 hour, thanks to the clear instructions in the Instruction Manual. Everything was quite straightforward. Seat Positions could be adjusted, and there were visible guidelines recommendation for the best seat position based on the child's age. As Khye was about 2 years old then, I used the Position-2. I love that OXO Tot makes it easy for future adjusts, as all I needed to do was to align the seat glide with seat position slots and push seat into position until it clicks. And I like that there is a safety measure which is a red sign there to let us know that the seat is not locked in properly if any red is visible on the release level (below left photo). As I said, OXO Tot makes it so easy for everything. Easy for us adults, not for the kids that is. To remove/adjust seat, pull out the side release levers on both sides, and simultaneously press down on both seat release levers to unlock seat while pushing the seat forward. 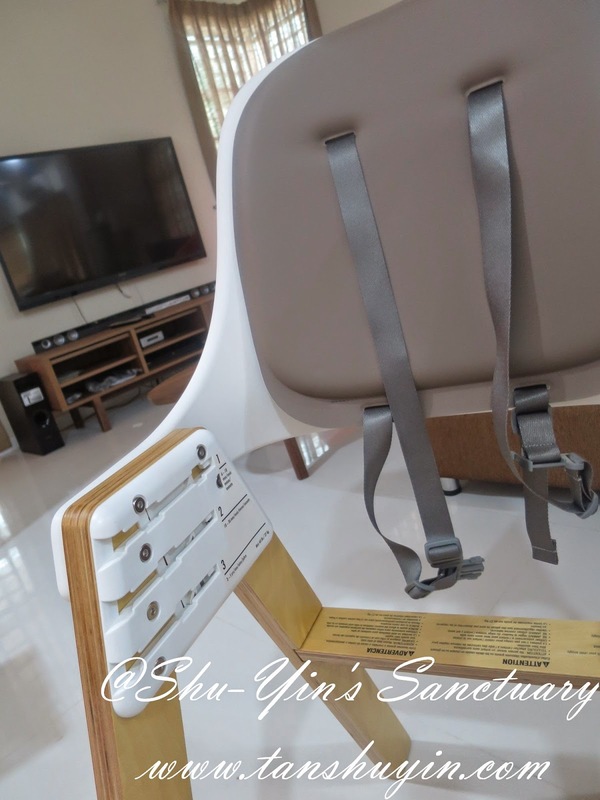 Footrest is also adjustable according to child's age/length of child's legs. 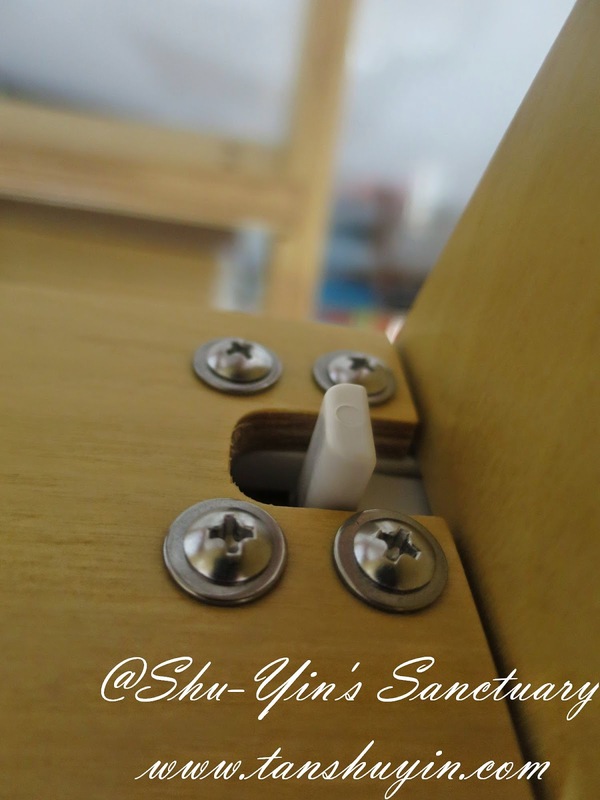 Slide footrest until you hear a 'click', and as usual adjustability is easy too by sliding the two footrest latches on the bottom of the footrest inward. 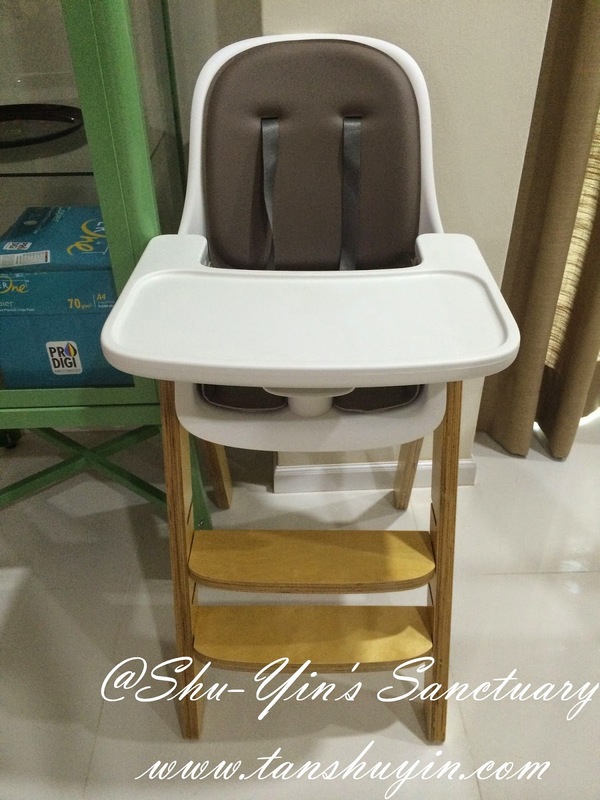 This is how the Sprout High Chair looks like after assembled. Front view, back view, side views. 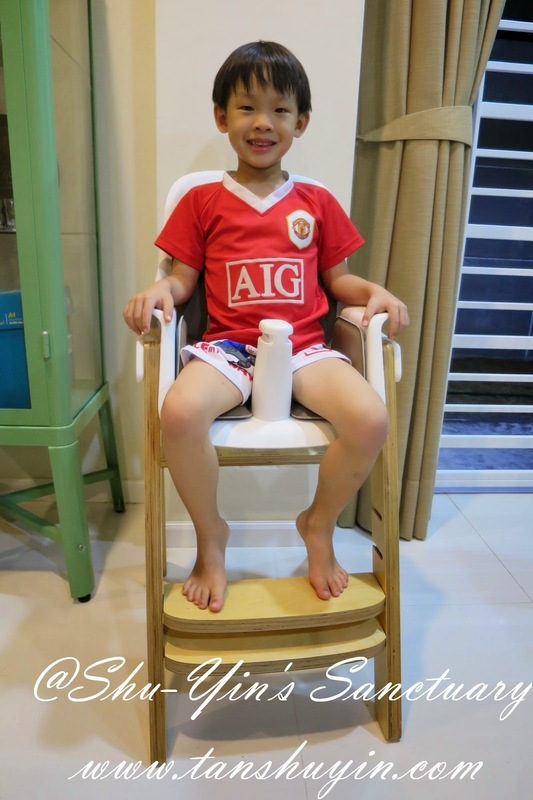 First of all, let me first tell you that this incredible chair is an extended use chair that grows with your child (like many OXO Tot's products!) throughout their developmental stages. 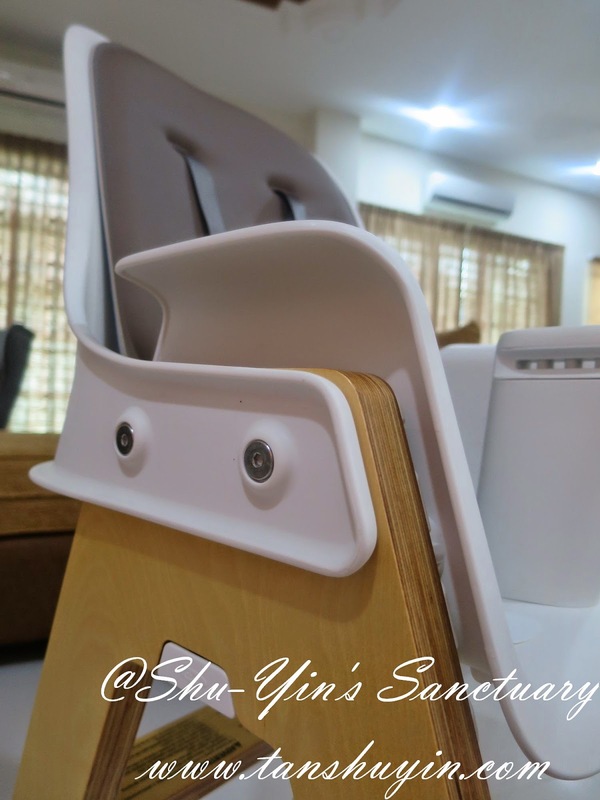 The seat adjusts in height, width and depth and the footrest is height-adjustable for a perfect fit during all stages. 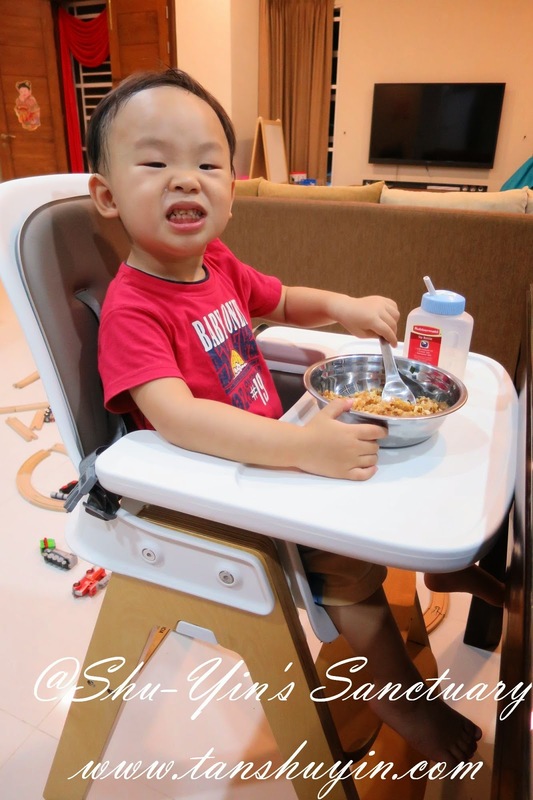 Awesome high chair, you agree? And I also love that this Sprout High Chair doesn't scream 'baby' and that it comes in a good colour that may match your house furniture. 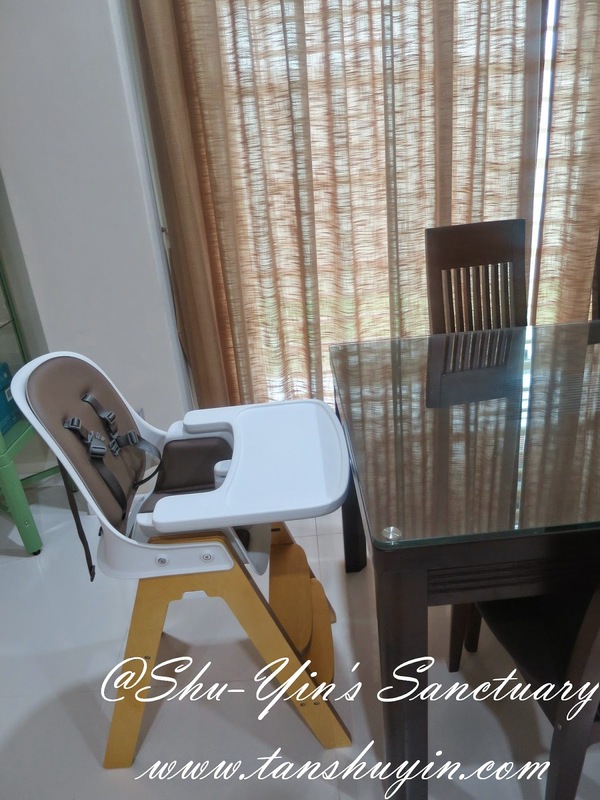 Ok, so you can see here that the high chair's tray almost reaches the height of our dining table, which means that Khye is now able to dine together with us! 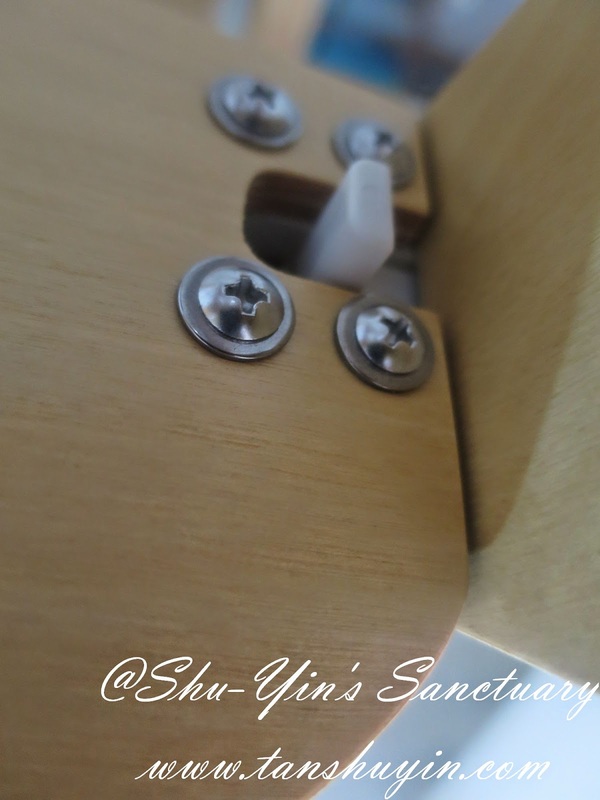 You can also choose to remove the tray and our dining table height still seems fine for Khye. It also came with a 5-point harness for added security and stability. 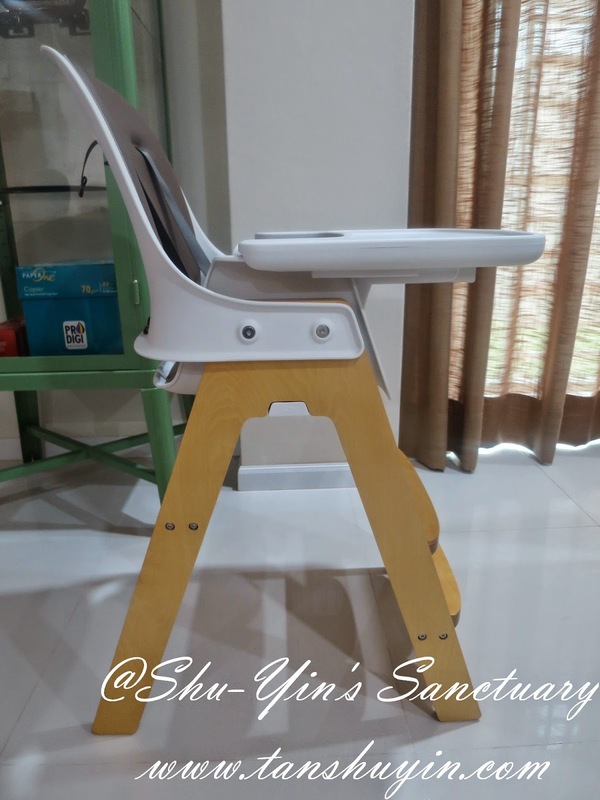 Anyway, this is useful if you kid is a 'climber baby', you know those kind that likes to climb and stand on top of the high chair and may fall or hurt himself. It even has a crotch post for even added security. I also like that the tray can be adjusted using just one-hand (one-handed tray adjustment). It adjusts the depth for children of all sizes. And I also like that the tray is a recess in tray, and is said to be able to contain 7oz of spilled liquid. This is great for us because Khye always tends to spill his food especially when he takes his rice with soup. 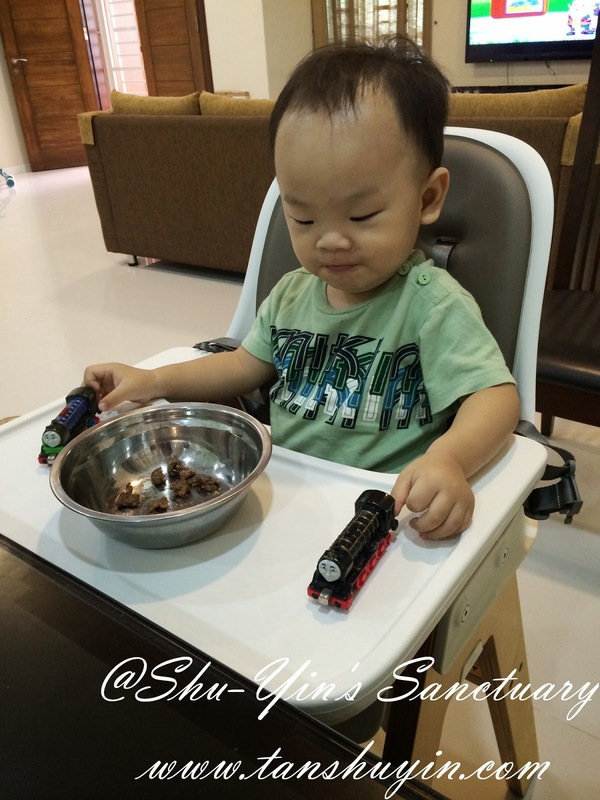 The recess in tray is also big enough and also provide a place for Khye to whoosh his toy cars/trains so they are not dropped on the floor so frequently. 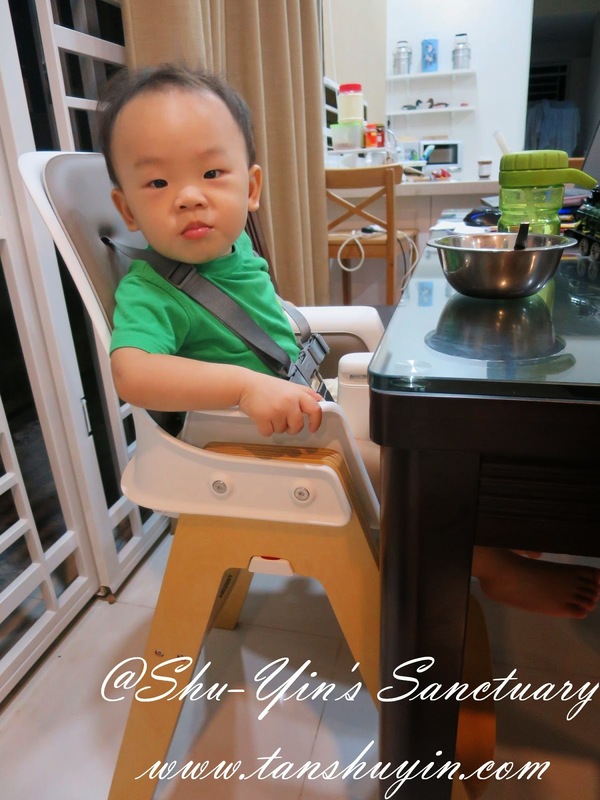 The high chair comes with velcro-in foam cushion, which is also easy to wipe clean. The foam cushions lend support and comfort for the children. 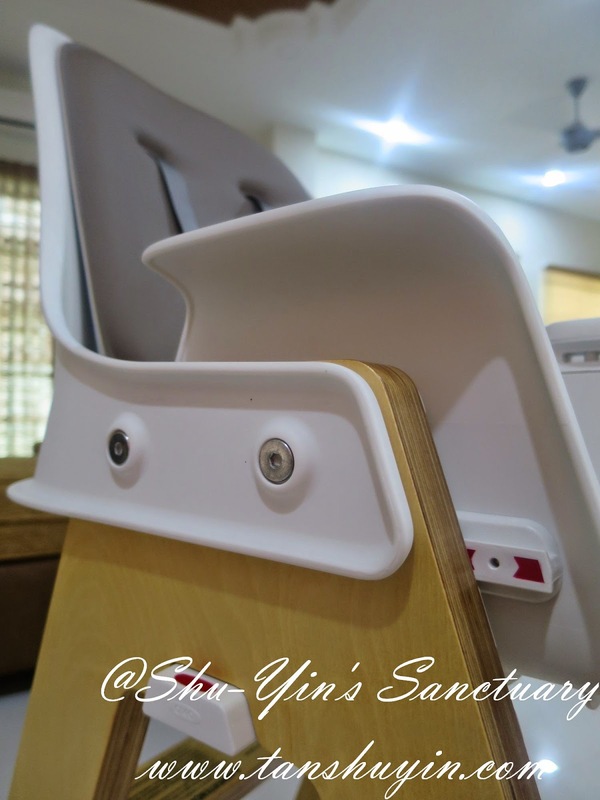 And another best feature of this Sprout high chair is that all chair surfaces are easy to clean! 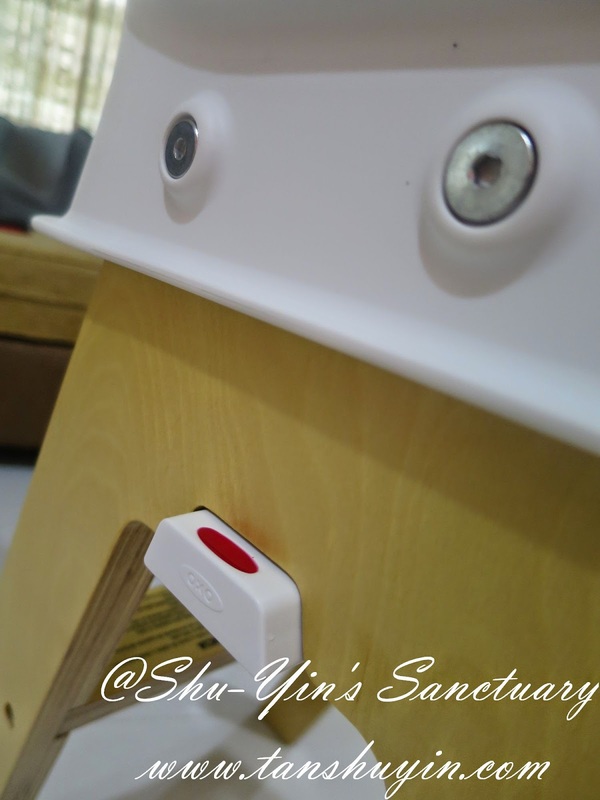 This is a very important feature for busy mums like me. 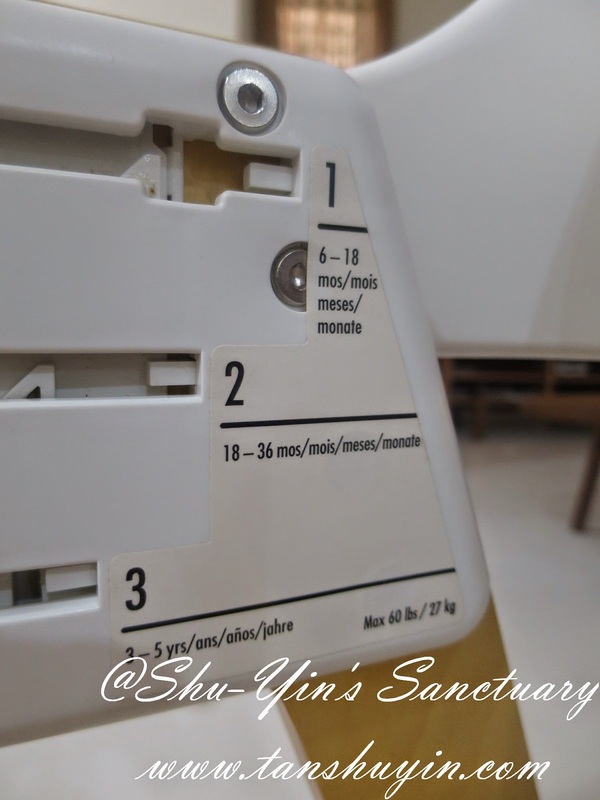 The white plastic materials such as the tray is of easy-to-clean material. Just use water and mild soap and just wipe clean. And those foam cushions are removable (by velcro) for thorough cleaning. 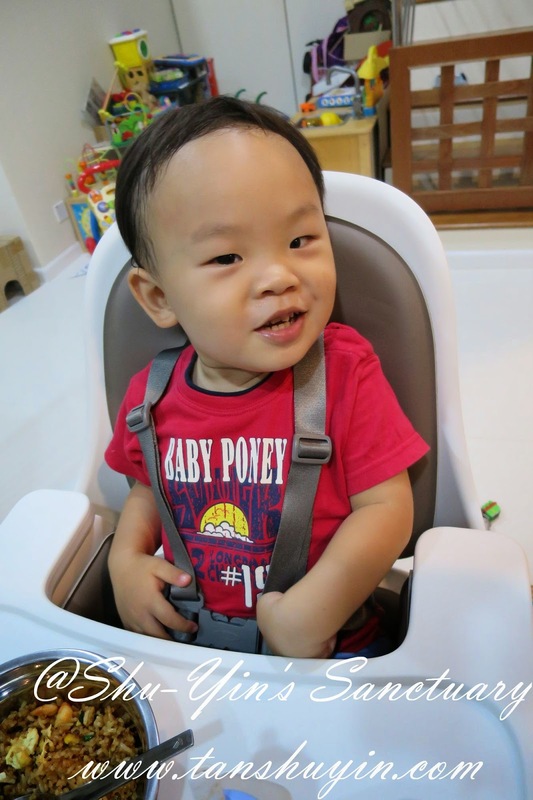 So for children 6 to 36 months old, Sprout is a high chair with two seat heights settings, with a crotch post, 5-point harness and tray. 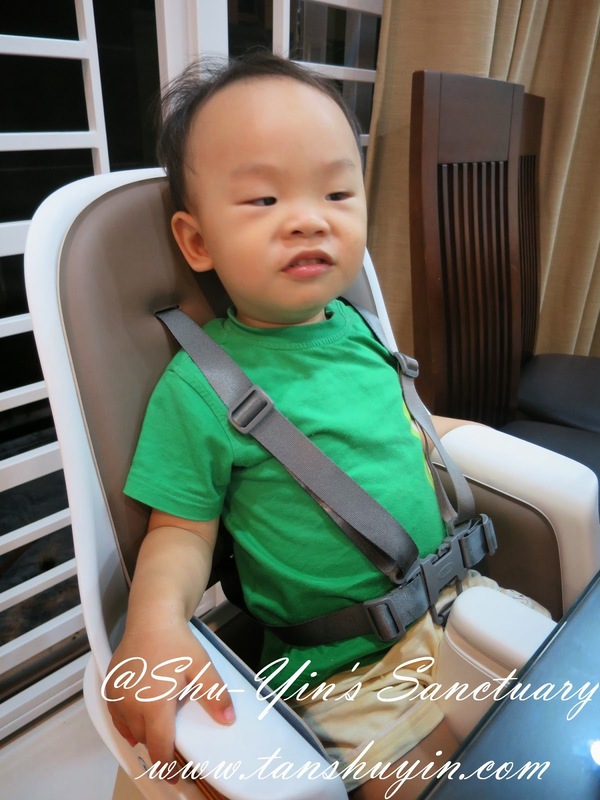 This is Khye enjoying and feeding himself on the Sprout high chair. It is really comfortable for Khye. Friends with babies that come to my house for visits also sit their babies here and everyone commented how comfortable it is! 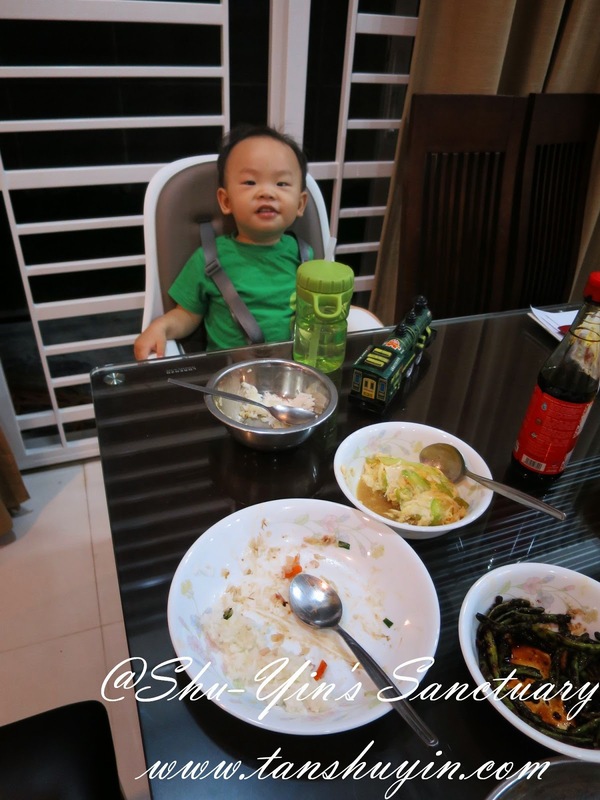 As Khye is now being seated on the same height as us on the dining table, it makes feeding him a breeze as he is now sitting on the same level as me. 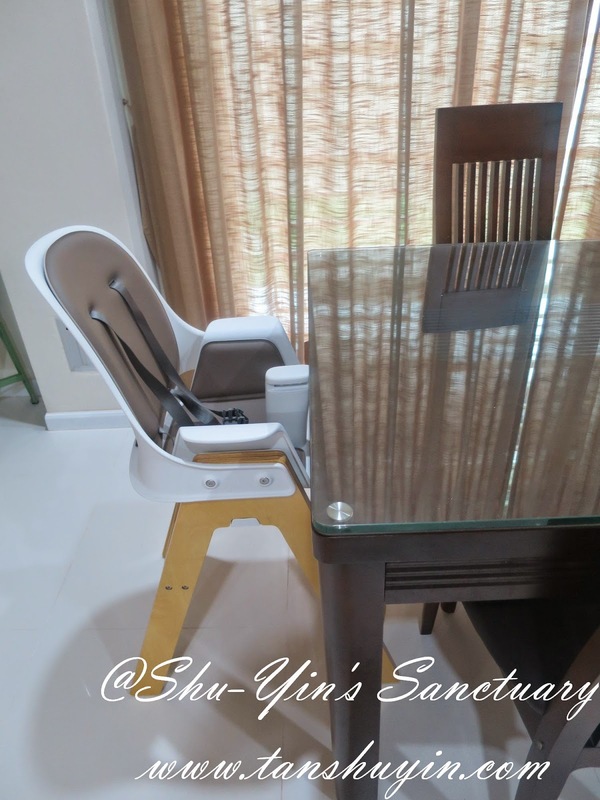 And like I mention, Sprout High Chair is an extendable chair, so it can be converted into a youth chair for children from 3 to 5 years when the seat is adjusted to the lowest setting, and crotch post, tray and straps are removed. I let Shern tried on it. I adjusted the seat setting and footrest. I did not remove the crotch post as it requires screws, so I was too lazy to do so. And hey, voila, Shern is tall enough to do some writing/building Lego on our dining table. 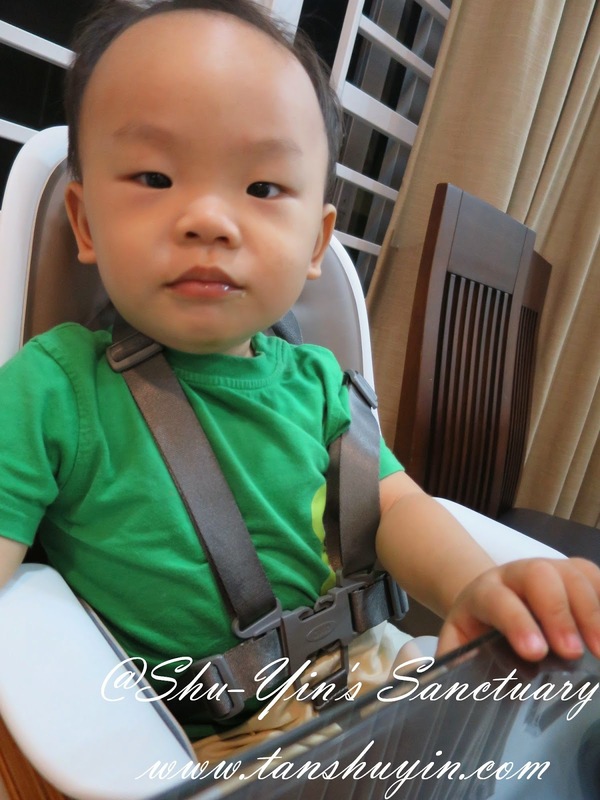 Usually, if Shern uses our adult seats, he would need a booster seat to heave his height up. 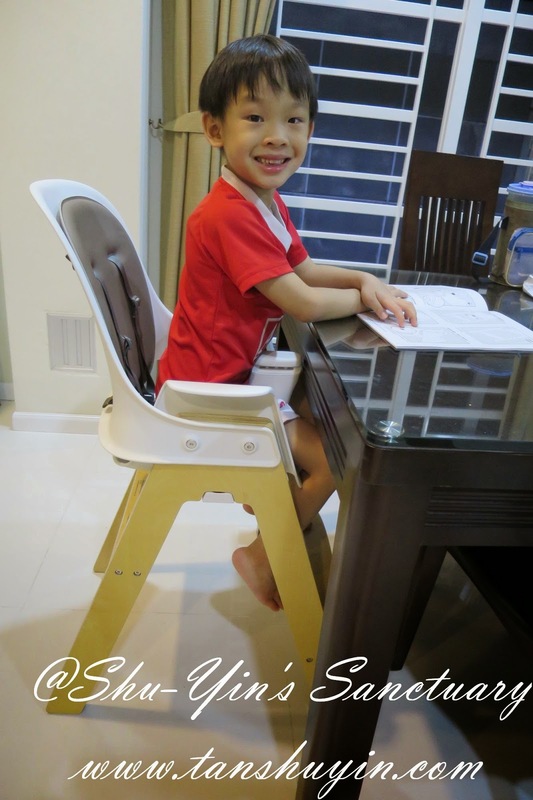 So this high chair once adjusted to his height, is just nice. The downside of it? Hmmm....I had a hard time thinking of a downside of this great product. It weighs 18 pounds, which is about the weight of an average stroller I would say. 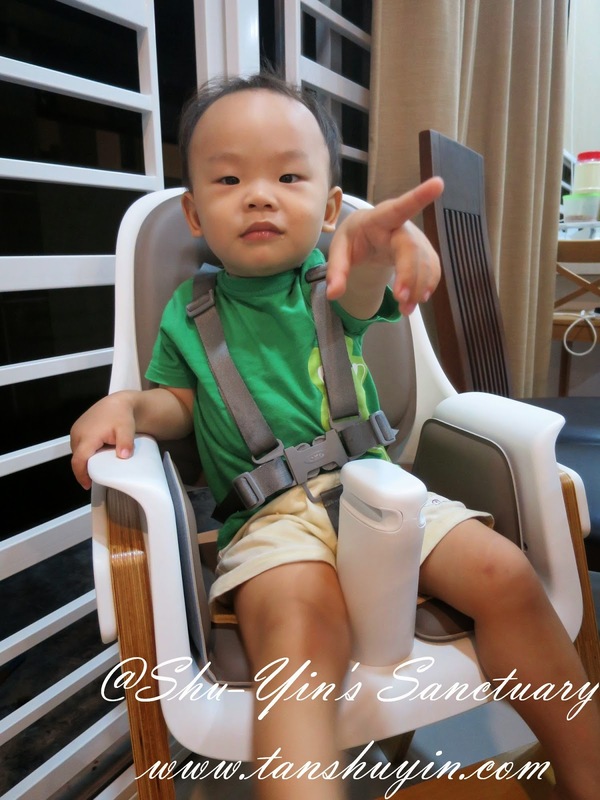 I also read that this Sprout High Chair won many awards. And many mums would be happy to know that the chair and cushion are PVC, phthalates, and BPA free. This chair can hold up to 60 pounds, which is about 27kg, and it is available in orange/birch, taupe/birch (like mine), green/walnut and pink/walnut. 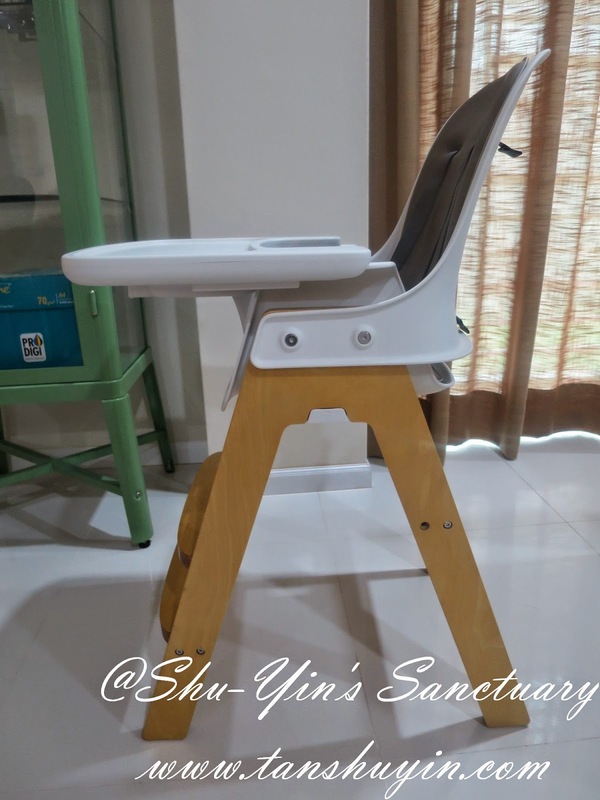 So all in all, this is a super cool Sprout high chair from OXO Tot which is not only sleek in design, but also packed full with useful features and comfort. 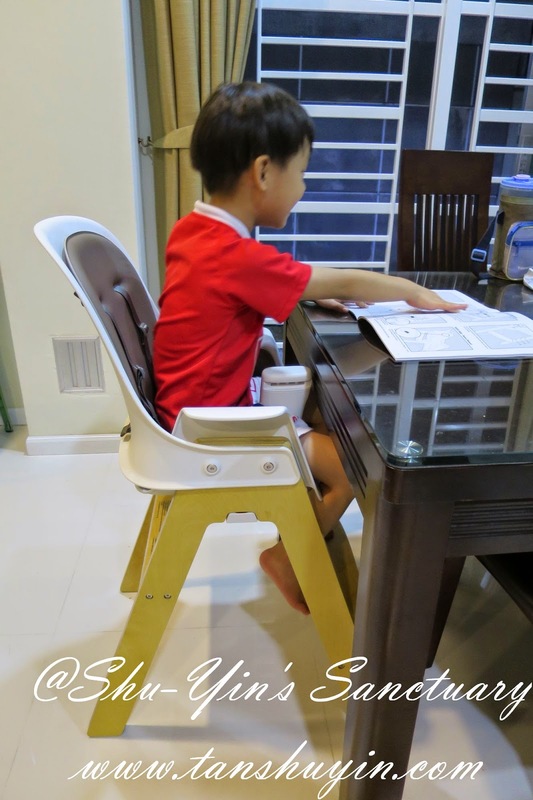 Many friends who came over to my house gushed about this high chair non-stop. So this explains why this is one of my very favourite OXO Tot products! 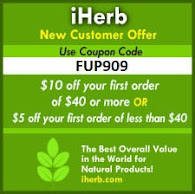 Please see below or visit Bloom & Grow Asia for their list of retailers. 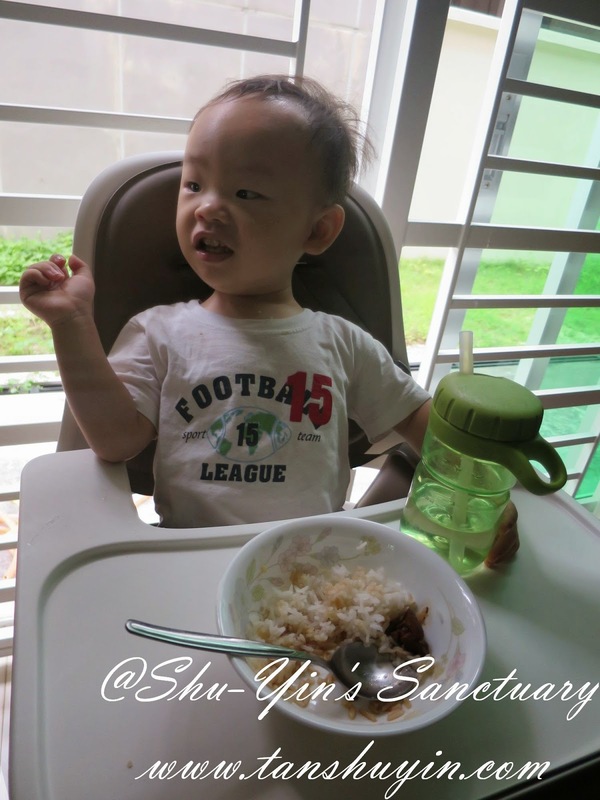 p/s - I'd also reviewed OXO Tot's Freezer Storage Container, Twist Top Water Bottle, Flippy Snack Cup, Sippy Cup Set, and Divided Feeding Dish. Have a click and read them all! 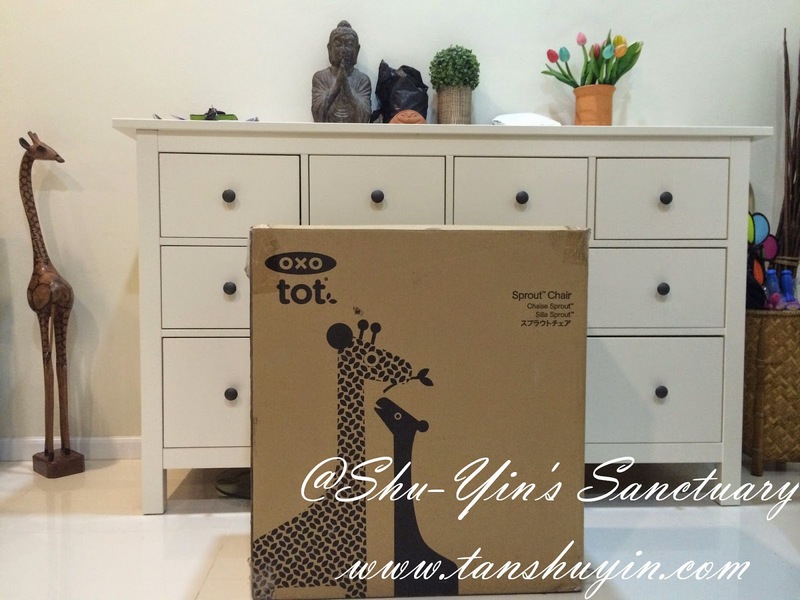 * Disclosure: I received an OXO Tot's Sprout High Chair Taupe-Birch for review purpose, but no monetary incentive was received. All text and opinions are of my own and represents my honest opinion of the product(s).